An interview with Wayne Elliott, founder and Director of Business Development, Marine Recycling Corporation. The original article was featured in The European on January 4th, 2017. Marine Recycling Corporation (MRC) is a globally recognised leader in ship recycling and in December 2000 became the world’s first ISO 14001 certified ship recycler. Innovative green ship recycling solutions, indepth knowledge and unparalleled experience are the foundation of the business. MRC understands that ship recycling carries great responsibilities and risks and is committed to supporting, promoting and practicing safe and true green ship recycling. The European caught up with founder and Director of Business Development Wayne Elliott to find out more. Please outline MRC’s priorities and objectives. Wayne Elliott: MRC has primarily focussed on recycling obsolete marine vessels of most types and sizes, including warships since 1973. MRC’s main operations facilities are located at the east end of Lake Erie at Port Colborne, Ontario, Canada, at the south end of the Welland Canal. Of all the marine vessels recycled by MRC and the Elliott Family, approximately 50% were recycled at this site. MRC was the world’s first ISO 14001 Certified Ship Recycler in 2000. Given that vessels can differ in many ways between types, size, hazardous materials included in original construction and layout, from a recycler’s perspective, each new type of vessel is a first and MRC understands that as well as anyone in the world. The team is experienced and has a full understanding and hands on experience with all aspects of green ship recycling. Third generation management, starting with President and Marine Superintendent Jordan Elliott, have taken the business and industry to a new level of excellence. The team is trained, certified and experienced in all aspects of marine decommissioning, vessel recycling and dead towing of dead ships. Training is ongoing and a serious part of our culture with a commitment to training on the job as well as third party training. What does your facility in Canada offer that is fundamentally different and how do you intend to expand those services to clients? WE: It’s not just our facility, it is our experienced, successful team. MRC has never had a claim for loss during dead ship towing operations nor ever lost a ship in its history. We have proven over time and over three generations that it pays to plan and do our homework. Our experienced team and systems ensure we do not miss anything and we work only with other experienced, competent sub-contractors. The key for MRC, unlike many ship recyclers in the world who are not directly managing their towing operations, is that MRC manages the entire process from inspection, custody transfer through to completion of recycling. The significance of the location in Ontario is the law which allows for the full and automatic transfer of both legal ownership and any ongoing environmental liability to the receiving waste facility. If you are in the waste receiving or processing business in Ontario, Canada you better do it right because it is all on the receiver, in this case MRC, as vessel owners cannot be held legally responsible. Liability is a major concern for all involved, including MRC. Hence the constant drive for excellence and continuous improvement in every respect. 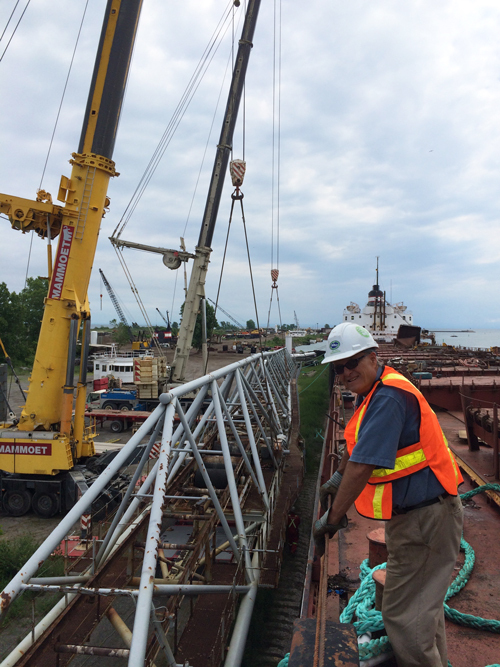 Green ship recycling in Canada has also enabled MRC to offer innovative consulting services to a rapidly changing global ship recycling industry. Discuss your compliance to Canadian health and safety legislation. WE: ‘Safety first’ is much more than the signs you see posted at all MRC sites and affiliated companies, as each is involved with various secondary materials, hazardous wastes, processing and recycling. We are very proud of what we do at MRC and our other companies. We know the effects of sound waste management and the benefits to our environment. Make no mistake our top priority is to the safety of our team and crews and their health and wellbeing. Safety and health are twins. No accident or health concerns are acceptable and MRC makes every effort to ensure its team is safe. Safety to the general public and surrounding environment is also key and hence the importance of proper towing preparations and emergency preparations, including the potential need to board a dead towed vessel in an emergency. This ensures overall safety, and the ability to perform first aid, rescue and retrieval, confined space entry, protection from airborne hazards (i.e. asbestos), as each situation requires. Dead ships must also be fitted with emergency towing lines, rigged so as to be easily retrieved in the event of a broken tow line. If you can’t do it safely, you can’t do it. Describe how you meet your responsibilities to the ship recycling industry. WE: Our responsibilities are and continue to be an industry leader and increase our hull count without incident, accident or injury. There is no other acceptable goal in our view and full insurance coverage including sudden accidental, pollution and wreck removal is in place as a precautionary measure. 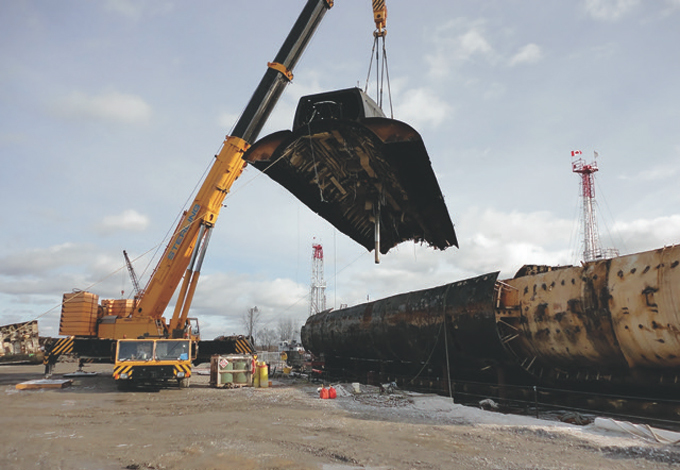 There is no replacement for experience in the ship recycling business, so you just have to hope everyone, regardless of experience pays attention to the risks and less to the price of scrap metal when approaching dismantling projects. This is clearly not the situation in much of the industry. MRC continues to support initiatives to make operators compliant and safe. MRC has provided consultation to a great many others, including other recyclers, and in the past created an ‘Eco-Safety Plan’ for Canada’s member to the Basel Convention, referable to ship recycling. At the end of the day, worker safety and environmental abatement and remediation costs must be accounted for in the price of recycling contracts. If price is the only factor, it is a race to the bottom, as we have learned the hard way in this industry. There are those using technology to a fault as well, sometimes increasing waste, co-mingling materials and, often without proper attention to safety including structural integrity of the vessel and structures, as it relates to worker and equipment safety as well as potential spills, fires or other safety/environmental issues. Discuss the importance of investing in new technology. WE: MRC has invested in large lifting cranes up to 250 tonnes capacity and shore based portable shears to increase productivity and reduce emissions, which has been very successful but only after trials on various vessel types and construction materials. More investment is needed in environmental waste processing and treatment as well as effective testing and sampling protocols for individual ships. Larger ship section lifts have also reduced emissions and safety hazards, as well as helped increase productivity. Innovations in removing the ship from the water, more efficiently, safely and quickly, has multiple benefits accordingly. How do you see the company developing in the short-term? And what does the company’s expertise allow you to offer your clients? WE: MRC is expanding the consulting work it does now. We have consulted to governments, departments of national defence, underwriters, owners, brokers, towing companies and other recyclers and are now our expanding international business. We have experienced salvage masters, and trained recycling, towing, waste and safety staff. This foundation of expertise and experience enables MRC to offer a range of consulting services including valuations, expert report and/or witness, towing and/or recycling compliance for existing or start up operations, bid document creation and review, technical assessment of bid submissions and insurance coverage. We also offer disposal surveys, salvage, environmental management, recycling facility audits, green ship recycling facility design and construction, legislation compliance, management training, and project management and supervision. When a ship’s last voyage ends our journey begins.